Grendel DC2e Eurorack "Drone Synthesizer"
A new eurorack synthesizer especially made for drones sounds… Very interesting ! Rare Waves USA just introduced a new analog synthesizer called the “Grendel DC2e” especially made for drone sounds. It is an evolution of one of their previous classic, the “Drone Commander”. 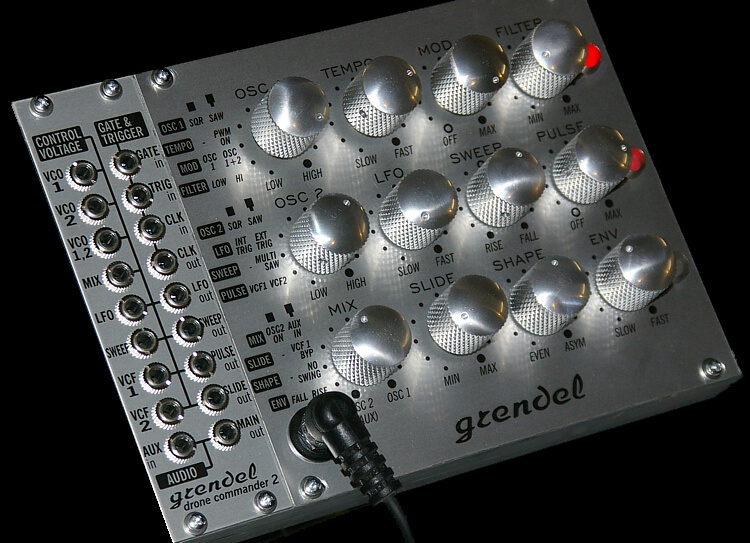 Grendel Drone Commander 2 is a true analog synth built with extensive use of discrete transistor technology. Its minimalist control panel presents twelve solid metal knobs, and every one doubles as a push-pull switch to modify the tone in thousands of possible combinations. Behind the panel is a newly designed all-analog sound engine with two oscillators, two filters, an envelope generator, and a comprehensive LFO section capable of producing four simultaneous waveforms. We’ve built in a number of features that can’t be found anywhere else, making DC-2e a unique and highly playable tone source for drone music, leads, bass, and sound effects. This model speaks up with an especially gnarly baritone voice and loads of bass. Its simple knob-per-function layout frees you from memorizing button-press sequences, eliminating those stifling “What does this bleeping computer want me to do now?” moments. Play the Main Module on its own, or add the Expander for lots of patching options. A stand-alone tabletop version may be announced in 2016… scroll to the bottom of this page for more answers to Frequently Asked Questions. The system’s heart is the Main Module, which houses the synthesizer’s core and all of its controls. On its own, the Main Module embodies the classic Drone Commander playing style, with manually tuned oscillators and a ¼” audio output for direct connection to your mixer, FX, or amp. A tough steel chassis protects its guts against knocks and interference from other stuff living in your synth case. With the optional Expander module, the system gains eighteen patch points for CV, gate + trigger, and audio. Its clock input allows synchronization to analog clock sources, and AUX IN lets you process external audio sources. As a bonus, the voltage ranges of some of the inputs and outputs can be switched between +/-2.5 volts and 0..+5 volts, facilitating connection to other synth modules, MIDI-CV converters, and various tabletop analog gear. The predecessor was known for its colorful filter, which DC-2e retains nearly exactly. The original filter (VCF 1) stands out with a tone-bending nonlinear bandpass effect, low frequency self-oscillations, subharmonic generation, and crusty overdrive. To complement this harmonic-generating power, DC-2e adds another analog filter to the signal chain: a 4-pole low pass filter with discrete transistor technology (VCF 2). It is positioned in the signal chain to subtract high frequency detail from the original filter, with warmth, cleanliness, and precision. Resonance (Q-factor) of the 4-pole filter is variable with a trim control on the side of the module (self-oscillation not possible). When a more basic tone is needed, VCF 1 can be bypassed (by pulling up the SLIDE knob), sending DC-2e’s oscillators directly to the 4-pole filter. This yields the classical timbre of two VCOs going through a -24dB/oct LPF. While in this mode, you can still adjust VCF 1 for self-oscillation, employing it as a third tone source for harmonious chords, or modulated for cosmic sine wave sound effects. An envelope generator is built in, sweeping the 4-pole filter’s center frequency between full cutoff (20 kHz), functioning as a low pass gate. It produces linear attack-release envelopes with symmetrical rise and fall time. Pull up the ENV knob to open the gate, and push to close the gate (or patch a gate signal to the Expander). This creates smooth crescendos, slipping in and out of your mix with subtle evolving harmonic detail. You’ll quickly learn the technique of creating fast attack/slow release effects via pull-turn-push gestures on the ENV knob. The signal chain starts with a pair of voltage controlled sawtooth-core oscillators, which are tuned manually with the OSC 1 and OSC 2 controls. The MIX control sets the blend. Push-pull switching lets you choose sawtooth, square wave, or an excellent pulse-width modulated waveform. The PWM effect comes from a special LFO section that is independent of the main LFO. It generates the sum of two low frequency sine waves at fixed frequencies. This uncommon configuration gives the PWM waveform a tone reminiscent of the beating effect of a unison guitar chord – always changing, yet without a dominating tempo or rhythm.. and once the filters go to work on it, the results are quite nice. The following demo features the PWM waveform… The oscillators are tuned in 5ths, and the main LFO is off. Recorded with EQ, reverb, echo FX, and overdrive from the mixing board preamp (StudioMaster Diamond) is added halfway through the track. Played on a MIDI keyboard with MIDI-CV converter patched to the Expander module. Pulling up the MIX knob mutes OSC 2, and with the Expander connected, this selects AUX IN to process external audio sources. The LFO section of DC-2e brings a completely revised approach from the classic model, yet is capable of duplicating the hallmark slow filter sweeps decorated with rhythmically quantized pulse wave details. A broad range of syncopated, polyrhythmic, and swing-time modulations are available to be morphed endlessly in real time with the TEMPO, LFO, SWEEP, PULSE, SLIDE, and SHAPE controls. The video below displays the Sweep and Pulse waveforms on an oscilloscope, illustrating the evolution from simple to complex modulations. The top trace is Sweep, and Pulse is the lower trace. With all these technical specifications, Eurorack modulars lovers will certainly keep an eye on this new synthesizer module. It is a quite exceptional kind of tool, more exotic than a traditional synthesizer module but still, a unique and great sound source.